The Karen National Union’s 19-member ‘peace talk’ delegation left the border town of Myawaddy this morning for official ceasefire talks in Pa-an Town, Karen State, with Burma government representatives on Thursday, January12. The KNU delegation is led by the Karen National Liberation Army chief of staff, General Mutue Sae Poe – Karen News understands that the KNU delegation have prepared 11 key points for discussion with their Burmese counterparts. The KNU 11 key points include – a demand for the Burma government to stop military operations in ethnic areas, start a nationwide ceasefire as soon as possible, to guarantee the human rights and safety of civilians, to build trust, to plan development projects that have the full participation and decision making of local villagers, to immediately stop forced labor and to stop excessive taxation and extortion of villagers. The KNU are also demanding the Burma government release all political prisoners, provide solutions to settle land right issues, to set out principles for a genuine peace process, to open a liaison office for peace talks, to allow unrestricted unarmed travel and movement in Karen State and to draw clear lines of controlled territory. The KNU have prepared a six-page document detailing their demands that are to be discussed at tomorrow’s Pa-an meeting. 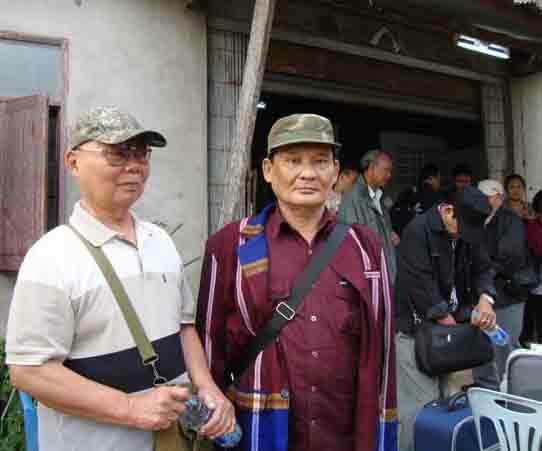 Padoh Saw David Taw, secretary of the KNU Peace Committee and also a member of the delegation spoke to Karen News and said that the mood of the delegation is positive. The KNU main delegates are General Mutue Sae Poe, Padoh Saw David Taw, Padoh Saw Ah Toe, Brigadier General Johnny, Lieutenant Colonel Roger Khin, Major Shisho, Major Ei Tha, Padoh Saw Kwe Htoo Win, Padoh Saw Lay Law Hsaw, Padoh Saw Aung Maw Aye, Padoh Saw Shwe Maunn and Padoh Saw Eh Wah. The delegation team will start their talk on January 12 with representatives from Burma government in Pa-an Town. The other seven members of the delegation led by Padoh Saw Thawthi Bwe includes a medic, two officers from the KNLA and three security personnel responsible for the safety of the delegation team. The Burma government representatives led by General Chit Than (retired) and U Ko Ko Maung from Myawaddy collected the KNU delegation team at 8:00 am this morning to drive them to Pa-an. The KNU delegation is also scheduled to meet with the Pa-an based Karen Peace Committee leader Abbot Ashin Pyinyarthami from Taungalay Temple and visit the Burma Army’s South Eastern Command Headquarters in Mon State. The Burma government peace emergence group led by Minister U Aung Min had met with Chin National Front on January 3 at Hakka Town and they signed ceasefire agreement on January 4. Burma’s media are predicting that the ‘peacetalks’ with the Karen on January 12 and with the New Mon State Party on January 20 will reach the first objective – ceasefire agreements. The KNU has been struggling for equal right and self-determination since January 31, 1949 and has been fighting against the Burma military regime’s for more than 60 years.